Our super intensive English course at inlingua Vancouver is called Star English Course. It is ideal for highly motivated students who want to maximize the time that they learn English in the classroom. Students in this course can take the widest possible range of English lessons that we offer at inlingua Vancouver. SE – Star English Course is a super intensive course. Students can learn English in our unique inlingua English Lessons (focus on Speaking), where they will improve their speaking skills and their grammar, pronunciation, reading, writing and vocabulary skills. 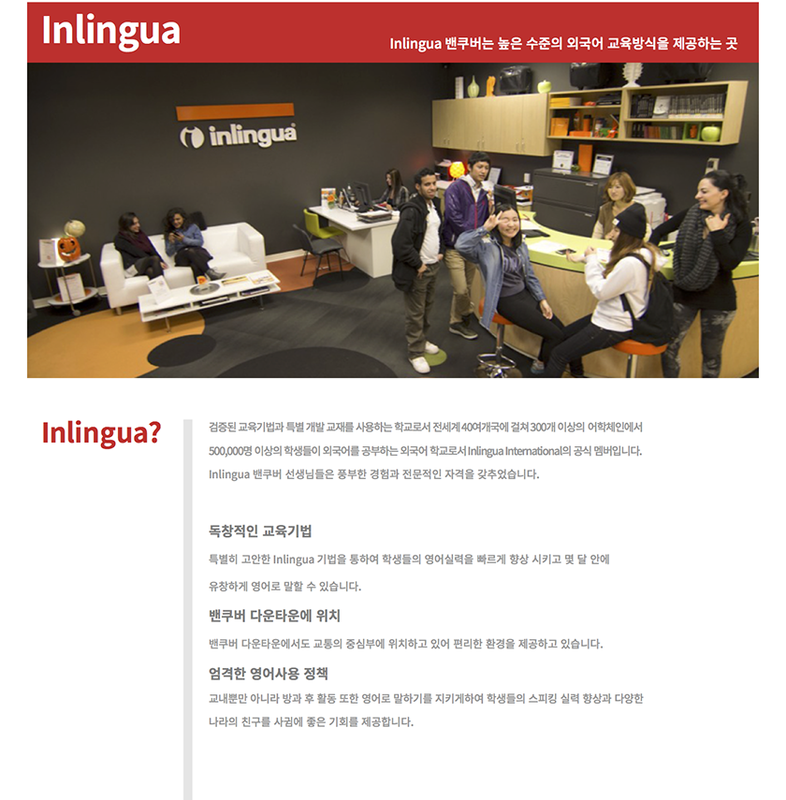 We use a special teaching technique called the inlingua method. The method allows each student to speak English, practice using target language and progress quickly. In the afternoon, Star English Course students may choose to learn English in a wide range of Elective Lessons from 1:00 PM to 2:30 PM and Elective Lessons or Semi-Private Lessons from 2:40 PM to 4:00 PM from Monday to Thursday. After reaching the upper intermediate levels, instead of taking the General English courses (ESL), students in the SE Star English course may choose to study one of inlingua Vancouver's specialized courses such as Business English or inlingua's Test Preparation Courses like Cambridge CAE or FCE, IELTS (intermediate or advanced) or TOEFL iBT test preparation courses, or the University Preparation Course. These courses run from 9:00 AM to 2:30 PM, so students can then continue to study English in Elective Lessons or Semi-Private Lessons from 2:40 PM to 4:00 PM from Monday to Thursday. The Star English Course includes 30 lessons per week. This course starts at 9:00 AM and finishes at 4:00 PM, from Monday to Thursday, and from 9:00 AM to 12:00 PM on Friday. 30 Lessons = 25.5 Hours per week. On the first day of the Star English Course, all students will be interviewed and take a placement test to determine their level, from 1A to 5B, for the morning Speaking lessons. Each Level lasts 4 weeks. Students can start their course any week. There are no requirements to take the Star English Course. This course is good for any level of English. On the first day of school all students will take a inlingua Placement Test and have an interview to determine their level. IIn the morning Speaking lessons, there are 3 weekly quizzes for levels 1A through 2B. For levels 3A through 5B, students write 2 quizzes and do one mid-term presentation. Students at all levels write a final exam at the end of the term and have a final presentation.